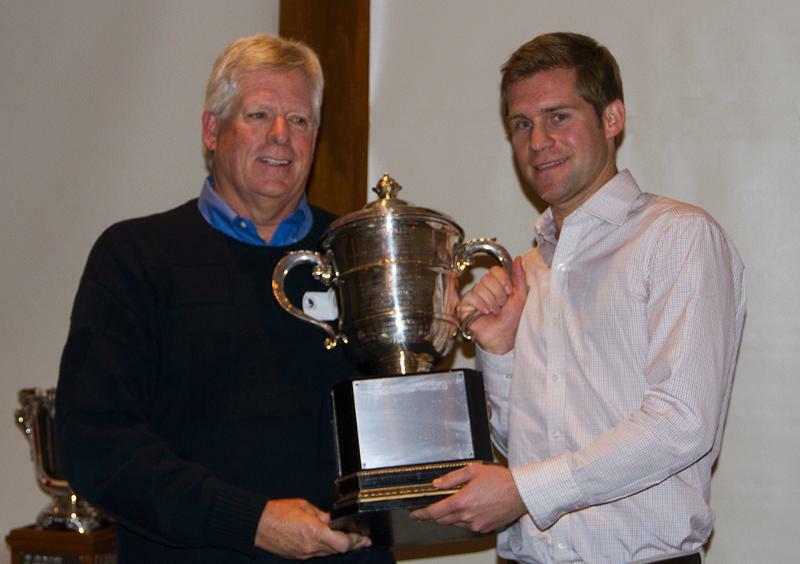 On February 9, at the Winter Inland meetings in Hartland, Wisconsin, the Inland Lake Yachting Association awarded its Edmund Pillsbury Memorial Cup to Vincent Porter in recognition of his big win in Class E at the 2012 ILYA Annual Regatta on Lake Mendota last August. Vincent Porter, with crew Clifford Porter, Coye Harrett, and Griffin Rolander, compiled an impressive 1-8-5-4-1-11 series at that regatta over a tough 42-boat fleet. Eight of the top ten finishers had previously won the ILYA Class E Championship title. In 1998, Vincent shared Pillsbury honors with his father and uncle for their victories at the Inland that year when Vincent won the Class X senior title, John won Class A, and Brian won Class E.
In 1952, Mr. and Mrs. John S. Pillsbury and their family donated the Pillsbury Memorial Cup in memory of Edmund Pillsbury, to be awarded to the skipper of the yacht, irrespective of class, with the outstanding record in the annual ILYA regatta. LGYC’s Bill Freytag, who won the Class C Championship at the 1952 Annual Regatta, was the first to receive the trophy. Since 1965, with the consent of the Pillsbury family, the ILYA has awarded the cup to the outstanding skipper at the Annual Regatta as determined by an anonymous committee of ILYA directors, appointed by the commodore.